Susan told me last Friday that a man had approached the picketers on Wednesday and said he was going to organize a counter protest. The protesters were civil – cordial, even. They told him he was welcome on the sidewalk any time. This is what freedom is all about. Susan told me he seemed surprised by the welcome, even as both sides expressed their view that the other was wrong. Jim had science and research on his side, he said, and he was out to set the record straight. While the StemExpress security guard watched from the sidelines, Jim and I exchanged polite conversation. “How long have you lived here?” Jim had me beat. My family’s only lived here since the late 80’s. He and his wife had been here since the mid-70’s. “I’m here because the Colorado shooter was incited by the language you use,” he said. “Okay,” I said, quickly regretting that the first words out of my mouth weren’t something like, What happened in Colorado was a terrible tragedy. I’m against violence in all its forms. But the moment was lost. The next moment, a man drove by, and honked and waved at… me. “Thank you!” my voice rang out to the driver. I said to Jim, “That’s seven.” We both smiled. “She’s exaggerating,” was all Jim had time to say before the man drove off – but not without first thanking me for being there. At this point the score was nine to eleven. Jim was still ahead. Another man drove back by twice just to clarify whose side he was on. He looked at me and said, “You should pack it in.” He was supporting Jim. But it wasn’t long before Jim and I were neck in neck at twelve supporters a piece. Then a couple walking down the sidewalk on the other side of the street stopped, read my signs and called out, “Can I take your picture? I want to post it on my Facebook page. What you’re doing is just great.” With that vote of support, I pulled ahead and looked back only once. Though accepting his point, Jim was clearly a nice man. At a big gust of wind, my unused signs were blown across the sidewalk and into the street – and he tried to help me collect them. “Oh, you will, indeed,” he said as he walked away and disappeared around a bend in the sidewalk. A few minutes later I was carrying my signs across the street to my car, thanking Jesus and acknowledging that the “win” wasn’t mine. That was a win for the voiceless whose bodies are bought and sold for profit and desecrated in the name of science. 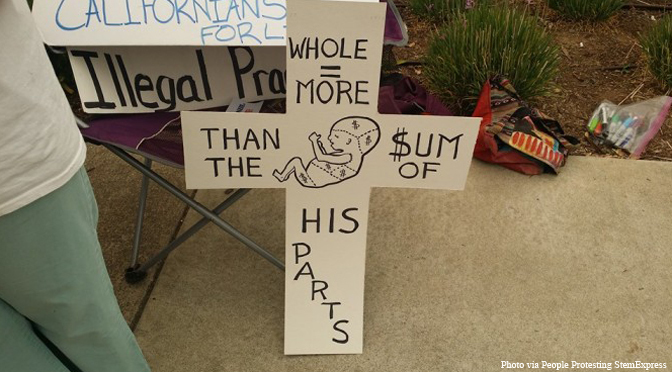 But Placerville, California, knows – or at least the majority of people who passed down Pacific Street this day know – that despite Jim’s show of support for StemExpress, the question of what should be done with the bodies of babies killed by abortion is not morally neutral. And despite all of the pro-abortion rhetoric since the shooting in Colorado Springs, what’s been happening at that abortion facility, day in and day out, both before and after a madman let loose his gun on the innocent, is a violent tragedy too. All human life – large and small, born and preborn – is worth standing on the sidewalk for, whether we win or lose.